One of my most important tools in the kitchen isn’t my stove, my knives, or even my cookware. It’s actually my laptop. It connects me with all my social networks. It kets me connect with the the people I love and admire the most, and helps me find and connect with new creative minds. I inspired by their creativity and imagination. Whether it’s browsing through Pinterst, chatting on twitter or Facebook or a good conversation on Skype, I am fueled by other people’s thoughts and ideas. It helps me recharge and refuel. And when the ideas start flowing, need my laptop to document the journey. I use to be very much a little of this and a little of that type of cook. But becoming a recipe developer made me learn to measure, measure and measure again. I make sure to try and write recipes to reduce or eliminate leftover ingredients and to keep costs low. Having a laptop in the kitchen helps me tremendously. I can also lookup basic recipe ratios. For instance a basic cake’s recipe for the fat to flour to liquid ratios. There’s a basic chemistry to all recipes. We as food bloggers and recipe developers don’t tamper with what works, those key ratios, but play with the flavors, textures and combinations of foods. 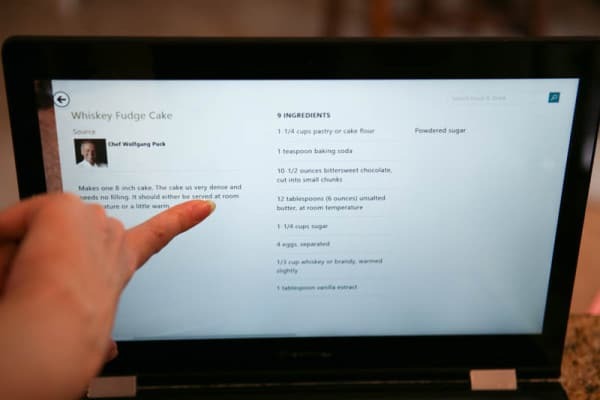 I’ve also used a tablet in the Kitchen, which I also love, but sometimes I just need that laptop. But it’s annoying going back and forth. I’ve even used my tablet with a keyboard, but it’s just not the same because there are so many things you still can’t do. 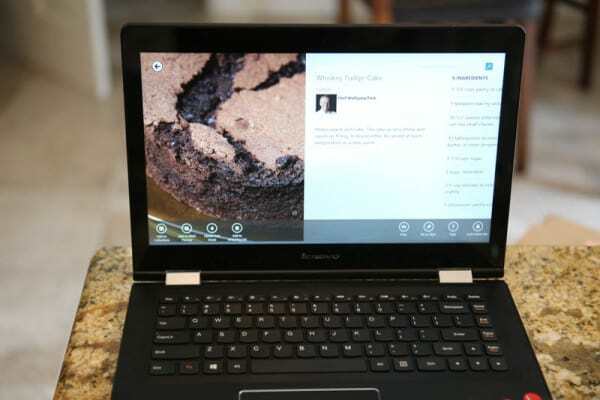 But then I was introduced to this new Lenovo laptop, with all the functionality I love about a tablet. 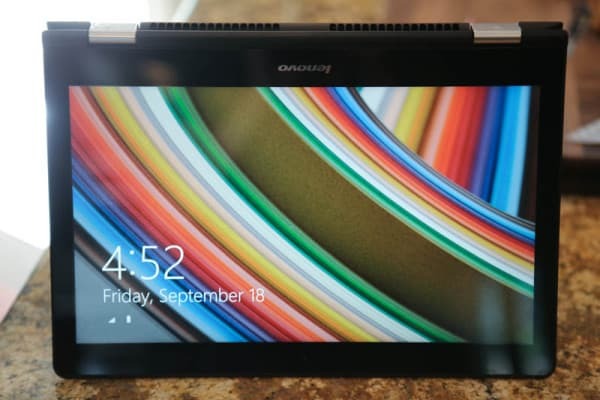 This Intel 2in1 has a touch screen and tablet icons that make switching between applications easy. 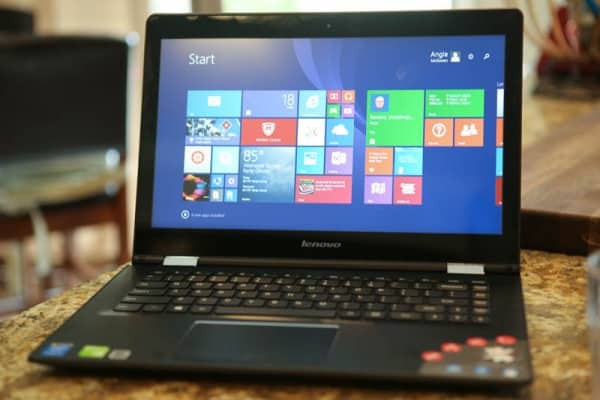 But it also has those USB ports we need plus the powerful Intel processor. You can also switch around the screen and bend it completely in the other direction, ultimately giving you the tablet that you need. Then when you want your laptop keyboard, just flip it around again. I also love how the screen flips around for watching movies and videos. It makes it so easy to prop up on a table and enjoy some funny cat videos with the kids. And did I mention how fast this laptop is? Compared to other Windows devices I’ve used, this one is by far the fastest. This laptop also came with Windows 10. It’s amazing, and so much easier to use. With Windows 10 you can easily switch back and forth between tablet and laptop mode, whichever environment makes you feel more comfortable. There’s also a Cortana virtual assistant (Like Apple’s Siri). And Windows 10 makes virtual desktops a breeze. Windows 10 really simplifies everything and makes things so much easier to find. The OS is clean, familiar, easy to understand and a wealth of new features. And guess what? It’s free to upgrade if you already have Windows 7 or 8 on a PC or Mac. Just click here to upgrade. 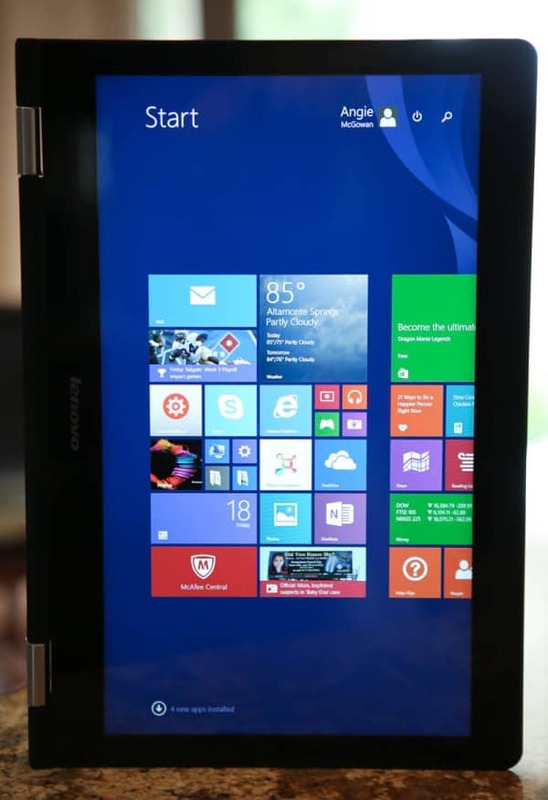 What’s your favorite feature of the new Windows 10? This is a great looking computer, I”m going to have to check it out! This looks like a great computer and I can’t wait to upgrade to Windows 10! I love that this computer has a touch screen, how cool! I just got a new computer but it didn’t have Windows 10. I really need to upgrade, great info. I saw these hybrids, for the first time, on Sherlock the TV series. They look awesome and I’d love to get me one, but I don’t see the point of getting since my work isn’t anything dynamic requiring a device 2 in 1 like yours.